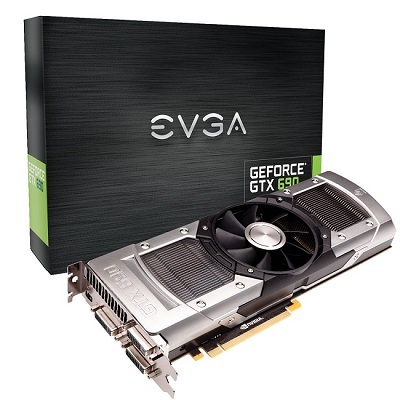 The GeForce® GTX 690 is NVIDIA’s fastest graphics card ever. It combines the groundbreaking new GeForce architecture with raw dual-GPU power to provide truly game-changing performance. Get superior gaming technology that’s meticulously designed – inside and out – for the fastest, smoothest, richest gaming experience. Dual Vapor chambers The dual vapor chambers help lower temperatures by as much as 4 degrees Celsius, keeping your graphics card cool and unleashing the overlocking potential. Kepler GPU Architecture NVIDIA’s Kepler GPU architecture has been designed from the ground up not just for maximum performance in the latest DirectX 11 games, but optimal performance per watt. The new SMX streaming multiprocessor is twice as efficient as the prior generation and the new geometry engine draws triangles twice as fast. The result is world class performance and the highest image quality in an elegant and power efficient graphics card. NVIDIA Adaptive Vertical Sync Nothing is more distracting than framerate stuttering and screen tearing. The first tends to occur when framerates are low, the second when framerates are high. Adaptive V-Sync is a smarter way to render frames. At high framerates, V-sync is enabled to eliminate tearing, at low frame rates, it’s disabled to minimize stuttering. It gets rid of distractions so you can get on with gaming. Two New Anti-aliasing Modes: FXAA and TXAA Anti-aliasing smoothes out jagged edges but can be demanding on framerates. FXAA is a new antialiasing technology that produces beautiful smooth lines with minimal performance impact. And with Kepler based GPUs, you’ll be able to enable FXAA in hundreds of game titles through the NVIDIA Control Panel. The second mode, TXAA, is an in-game option that combines MSAA, temporal filtering, and post processing for even higher visual fidelity.